"I have to remove QuickTime media player from my Windows PC due to the reported security issues, now I need to convert QuickTime to MP4 as my Windows Media Player won't play QuickTime movies but it will play mp4." Recently, the US government has asked Windows PC users to uninstall Apple's QuickTime player after two new bugs were discovered in the software. PC users, after remove QuickTime, have to change QuickTime MOV to MP4 or wmv, avi, mp3 files as they find that they can't play QuickTime movies on Windows for that Windows Media Player, or Blu ray player and many others don't support QuickTime MOV M4V files. Given this, we share ways on how to convert QuickTime movie to MP4 on Windows (10/8/7/Vista) and on macOS (10.14 Mojave) in world's fastest speed without losing video audio quality. The first method is to rely on a third-party tool. Here the fastest QuickTime video file converter we recommend is MacX Video Converter Pro. It works seamlessly on Windows (10/8/7/Vista) and macOS (Mojave) to convert QuickTime to MP4, AVI, WMV, MP3, MPEG etc, or decode MP4 to QuickTime MOV with fastest speed and no quality loss. Easily convert QuickTime HD videos, movies, M4V, MOV files to mp4, avi, MP3 etc for Windows Media Player, Blu ray player, VLC etc, as well as decode MKV, AVI, WMV, MP4 to QuickTime, iMovie, iTunes, or iPhone Xs/X/8/7/6s/Plus, Android Samsung Galaxy S9/Note 8 and more. Transcode QT to MP4 in proper bitrates, proper settings, reduce output MP4 file size without losing quality etc. The support Intel QSV hardware acceleration and HT tech makes the Quicktime video converter deliver the fastest QuickTime MOV, M4V, AVI to MP4 conversion speed, 5x faster other QuickTime movie to MP4 converters and the High Quality Engine guarantees nearly no quality loss. The whole QT to MP4 conversion will be safe and stable, with no ads, virus or malware. 1. Stable, reliable and ads-free. 2. 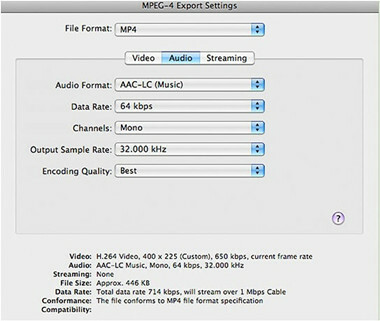 Various video setting options for QuickTime to MP4 conversion. 3. Fast speed and high quality guaranteed. 4. Wide-range of supported and output video formats, devices and players. 5. A slew of other powerful functions like download online videos, edit video clips etc. 1. It is required to download and install it on Windows/Mac. Step 1: Free download this fastest QuickTime to mp4 converter for Windows (10/8/7/Vista) on PC or the QuickTime MOV to MP4 converter for macOS. Run it and click "Add File" to load the QT video files you want to convert. Step 2: To convert QuickTime file to mp4 format, choose MP4 from the popping-up windows as the output format. 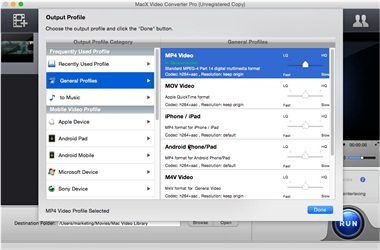 For the output QuickTime HD MP4 videos, you can also reduce the file size, customize the video settings etc. Step 3: Click the "Browse" button to choose the destination folder where you want to save the output MP4 files converted from QuickTime MOV videos. Step 4: Click the "RUN" button to start to convert QuickTime to MP4 on Windows/Mac now using the best video converter for Mac. You can play the QT videos on Windows Media Player, or mobile devices in minutes. There are various online free QT mov to mp4 converters providing option to free convert QuickTime mov m4v to mp4, wmv, mp3, avi etc. files-conversion.com, zamzar, convertio.co are all among the best free QT to mp4 video converters online, but considering the diverse features, we recommend online-convert.com. 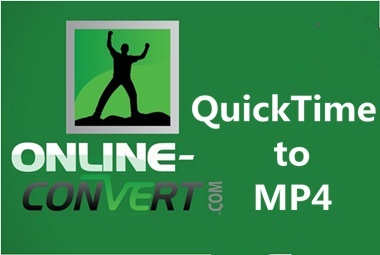 This free online QuickTime MP4 video converter allows PC/Mac users to convert from 50 source formats, including QuickTime videos formats MOV M4V etc. to mp4, avi, wmv, or convert MP4 to QuickTime and about 30 other popular formats. It excels many other free QuickTime video to mp4 converters online is that it has options like bitrate, file size, frame rate etc for users to customize the output mp4 files. You can just upload the QuickTime movie you want to convert to mp4, and follow the simple steps to start the conversion. 1. Cross platform - online QT to mp4 converters will run on Windows (10/8/7)/Mac (El Capitan) /Linux. 1. Simple and single feature. 2. Easily get stuck in QuickTime to MP4 conversion progress, especially for QuickTime HD movies, if the internet is not strong enough. 3. Output quality may vary. And it always delay in QuickTime to MP4 conversion. 4. Less control over the QT mov files, users don't know where and what's done with it as they are kept in the web servers. Many are ad-supported or even brimming with plugins, adware. The last method to convert QuickTime mov to mp4 on Windows/Mac is even more easier. In addition to desktop/online QuickTime to MP4 converters, if your Windows/Mac has installed QuickTime Pro or iTunes, they have ready-made solutions to free convert QuickTime movie to mp4 format. 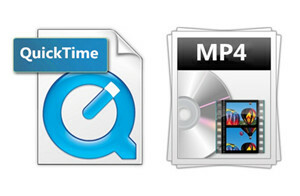 With QuickTime Pro: Make sure it's QuickTime® 7 Pro or later. Open QuickTime Pro > click Open File to open the Quicktime files > click Export > A dialog called 'Save exported file as…' will open > select "Movie to MPEG-4" and it will ready to convert QT to mp4 > Click "Save" to set an output destination and then it will start the conversion. With iTunes: Make sure it's version 6.0.7 or later. Open iTunes > Choose 'Movies' in 'Library' and select the Quicktime MOV file to be converted to MP4 > select mpeg-4 in "Convert Selection for iPod" from the advanced menu and it will start to convert QuickTime files to mp4 files free on PC/Mac. 1. Extremely easy to convert mov QT videos for Windows Media Player etc. 2. Good output MP4 quality reserved. 2. Limited editing features or MOV file size compression etc. 3. No other functions available. * MP4 vs MOV in compatibility, MP4 is a universal container format accepted by media players like Windows Media Player, VLC, KMplayer, mobile devices, NAS drive, Cloud services etc. while MOV is friendly with Apple devices and software. * By converting QuickTime to MOV, you get smaller file size with the same quality. * MP4 video is suitable for fast streaming on the internet.